Austin Broderick and his father Dean Broderick were on their way home after a shopping trip to a Walmart branch in Florida when they came across a truck stuck on the train tracks. 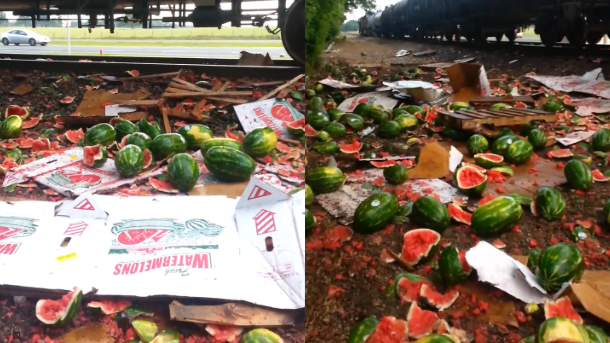 Moments later, a CSX train slammed into the truck's trailer which turned out to contain hundreds of watermelons. No one was hurt during the incident. The driver of the truck was out of the vehicle when the train slammed into it. The train conductor saw the trailer from afar and was able to signal an emergency but the train wasn't stopped on time. "It's like it was in slow-motion. You hear the train, then it's dead silence, and then wham! I've never seen anything like it. It was breathtaking." Dean Broderick told the Orlando Sentinel. The train was pulling 130 cars but 78 of these were empty.